A Song A Day: Feb 28th – 12 in 1! It’s Monday again! I’m excited about March being just one day away now – I’ll be undertaking the 30 day song challenge (which is doing the rounds on facebook) throughout March, see the link above. This afternoon onwards I’ve been thinking about my favourite films in some detail. The reason being is because I’ve done a deal with fellow bloggette and film fan Dark Vador and we’re going to be making a top 10 post in the forthcoming days, which we’ll both post on the 14th March. So, 2 weeks from today. The trouble is, trying to sum up my favourite films is going to be harder then I think – but, there again I like a challenge, and it’s all a good bit of friendly fun. So there I was with Evernote open making notes and ideas about films and possible wordage to go alongside them, whilst listening to my film soundtracks playlist open in Spotify. This following track came on, and it was stuck in my head for the rest of the day. It’s also a very cheeky way to cram more songs into this blog. It’s a medley of many a well known love song strung together and sung in a very grandiose style. This is the Elephant Love Medley from Moulin Rouge… which may or may not be making an appearance in the aforementioned top 10 list! Love lifts us up where we belong, all you need is love. 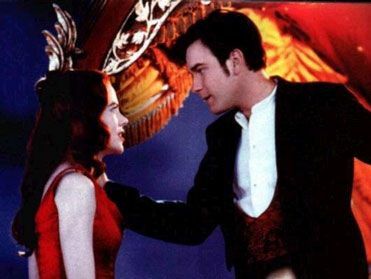 Satine: Please, don’t start that again. C: All you need is love. S: A girl has got to eat. S: Or she’ll end up on the streets. S: Love is just a game. C: I was made for loving you baby, you were made for loving me. S: The only way of loving me baby, is to pay a lovely fee. C: Just one night, give me just one night. S: There’s no way, ’cause you can’t pay. C: In the name of love, one night in the name of love. S: You crazy fool, I won’t give in to you. S: You’d think that people would have had enough of silly love songs. C: I look around me and I see, it isn’t so, oh no. S: Some people want to fill the world with silly love songs. C: Well what’s wrong with that? I’d like to know. ‘Cause here I go again! Where eagles fly, on a mountain high. Throw our lives away, for one happy day. C: We could be heroes! Just for one day. S: You, you will be mean. S: And I, I’ll drink all the time. C: We should be lovers. S: We can’t do that. C: We should be lovers, and that’s a fact. S: Though nothing, will keep us together. Both: Just for one day. We could be heroes, forever and ever. C: Just because I will always love you. It’s Sunday again??? Whoever stole the last 7 days would please be so kind as to return them, no questions asked! It’s been a good week, I’ve had some great fun reading, reblogging and supporting some other blogs. Pub Quizzage on the Tuesday, Hippodrome meet ‘n’ greet on the Wednesday, McDonalds on the Friday and a nice family night on the Saturday! It’s the little simple things that are the best! I’m having a lot of fun on this blog at the moment. I look forward to Wordless Wednesdays more and more each week. It’s such a simplistic idea it’s genius. I’m enjoying posting instrumentals or instrumental videos/film clips on this day. If you are a blogger, and aren’t aware of Wordless Wednesdays, then I suggest you get into it. It’s simple, just put up a post with no words (it could be a thought provoking picture or video… for example, there are no rules as such) and head on over to the Wordless Wednesday site and put your name down. It’s super fun! Very Important Notice: During March, I’m going to be taking a stab at the 30 Day Song Challenge. I’m going to create a seperate page for this and put the rules/instructions up there. I urge you all to take a go at this, it’ll only take a moment or two each and day and it’s one of those things that everyone will have personal motifs for. It should be a blast! – Make sure to tell your friends! But that’s tomorrow onwards… what about today?! – It’s Sunday, so I feel like I need some Sunday music. I don’t have much planned for today, i’m going to help my Dad wash the car, and mum make dinner so if it rains, you can blame me. Sunday’s should be lazy days. Washing the car, maybe getting a freebie with the Sunday paper, watching Top Gear and putting your feet up in front of the football! So to sit along side that, you need something equally laid back. Thanks to a friend in Belgium called Kevin, who is a human Doors museum, he hooked me up with all of their albums God bless him. I’d like to post a Doors song today, namely Riders on the Storm. I love this song so much, it’s very laid back and ambles along with a glorious jam which is so traditional of The Doors sound. This is one of their definitive pieces in my book. I don’t quite know why, but today I feel sleepier then I’ve felt in a while, maybe being out and about the past few days has caught up with me. There is good news in that I can see a damn sight better today (see what I did there?) I can comfortably keep my left eye open now, which is always nice to be able to do! Anyway, I’m going to keep things shorter today, and get into bed and crash out in front of the TV.. I’ll try and stay awake for Family Guy (I tend to watch it every night, irregardless of how many times i’ve seen each episode!) but it’s starting at 12-25am – I’m tempted to miss it – I could do with a PVR in my room! Oh… the good ol’ days when VCR’s prevailed (there’s potential for a nostalgic posting there, everybody loves a bit of nostalgia…right…?!) It’s just dawned on me that I’ve had a McDonalds twice in 3 days… Not sure whether to feel proud of that, or to feel shameful of it! Today’s song is a dedication to my partner in blogging crime, Aditi. She’s beginning to struggle with the postaday challenge, which is something I’ve felt and I’m sure others reading this may well of felt. As fun as it is to do, It’s not always the simplest/easiest thing to do. Earlier today, Aditi said she’d like some inspiration and such like to get into a blogging mond again….so, Aditi, this song is for you. Long Long Journey by Enya. Whilst we are talking about shoutouts… I’d like to give a virtual shoutout and list a couple of blogs I’ve been enjoying recently and have discovered since going down the postaday road! All of these are well worth checking out! The Running Garlic – It’s impossible not to mention Debbie and her all-conquering blog. She also keeps the facebook group (links below) ticking over – a stack of content awaits! Paula’s Story – A very honest, upfront and sincere blog by a wonderful girl called Paula. So yes, I urge you to check out the above blogs – they’re all fantastic. I’m sure there are many more I’ve missed out – but that early night is becoming less and less likely as 1am fast approaches! Take care and see you again tomorrow…. A Song A Day: Feb 24th – Blurry Blogging! This is a perculiar typing experience. I seem to have developed conjunctivitus in my left eye which basically means i’m typing this with pretty much only one fully working eye! My right eye is tickety-boo, but my left eye is all bloodshot, puffed up and watering rather a lot. I look like a reject from a Sci-Fi B Movie! It’s seems easier to keep that eye shut and just use my right eye. My glasses aren’t really making much difference at this point. Everything has a subtle out-of-focus look to it at the moment, unless I open my left eye, at which point everything goes nice and sharp again. It really is perculiar!!! I think I get +1 points for randomness! I was so tempted to post Blurred Vision by Queen, which on title merits is highly apt, but on song/lyrical content, quite the opposite. It’s basically One Vision, the 12″ version, which for casual everyday listening isn’t such a bad thing, but I wasn’t feeling like it was blogworthy. For the 2 minutes that this song lasts, I challenge you not to sit still. This song will make you wanna get up, boogie around the room and just let yourself go… for 120 secs! Hey, that’s got to be a good thing yes! At the very least I imagine some rhythmic tapping of the feet will occur! What a day that was! Those of you who read this blog will know that I was attending a meet and greet at the Birmingham Hippodrome theatre. WOW! We got a backstage tour of all the technical departments and met the tech team, they’re super nice and the tour was an interest from start to end. I’d dressed formally(ish) so I had on smart shoes. We ended up having to climb some stage ladders and what-not to get up onto the walkways above the stage. I worked out it out at about being 32 feet above stage level (if you had vertigo, you’d of been jiggered) Whilst I was up there I was just thinking about phantom of the opera and had visions of a chandelier expecting to come down on a wire, or the phantom lurking in the shadows. Alas, I got neither, but it was all very interesting the same. I think the top top level will be about 50ft, maybe even more above the stage. Incredible feeling/views. The song most associated with the club is You’ll Never Walk Alone. Gerry and the Pacemakers have the most well known version and it’s sung before, after and several times during each game. When the Kop end get’s in voice, it’s a sound that stirs and invigorates the senses. It makes the hairs stand on end. The song was originally intended for a musical, but ended up being adopted by football afterwards. 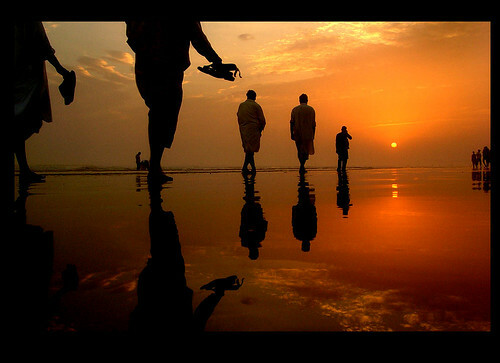 The song carries a strong message – though your dreams be tossed and blown… walk on… walk on with hope in your heart. It’s one of those songs, along with REM’s everybody hurts that no matter when I hear it, it makes me happy and if I’m feeling down, it helps cheer me up. So tonight when the football is on, I’ll be humming away happily to myself inside! This was posted over on Grandeurvision, a wonderful blog by a wonderful person called Marianne. I urge you to check it out. This post is my first ever re-blog. A fantastic poetic piece of writing indeed.